The Spring melt is in high gear! This picture of the 10th hole at Hilldale was taken on 3/10/15. With several more days of warm weather (Sunshine!) this picture should look much different by the weekend. 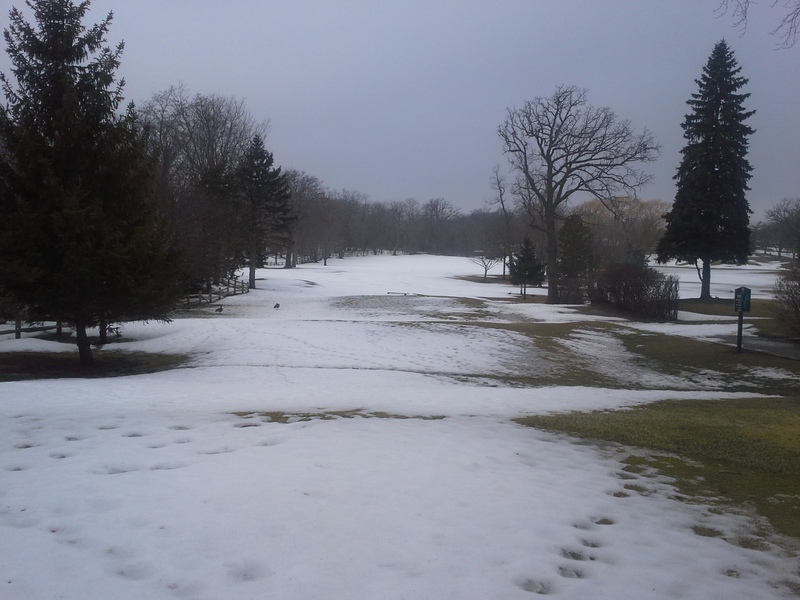 For those golfers wondering about opening the golf course…my best guess at this time is hopefully toward the end of next week. I’ll be very pleased if conditions are dry enough (greens) to open by 3/19 or 20th. I’ll keep you informed with updated progress pictures such as the one above and chime in with twitter posts (upper right side of this page) as we get closer to a total snow melt . Thanks for checking in. This entry was posted on Wednesday, March 11th, 2015 at 1:21 pm and is filed under Uncategorized. You can follow any responses to this entry through the RSS 2.0 feed. You can leave a response, or trackback from your own site. One Response to The Spring melt is in high gear! Thanks for the update Bryan. Looking forward to getting out this year!